Washing your windows consumes a great deal time and efforts? You can change this now – simply contact our operators and book our window cleaning in New Barnet. We will handle this matter for you and the results will be ideal for each part of your windows – glass surfaces, framework and ledges. With our support, you will have the freedom to do anything you like with the time you usually spend for window washing. But our services will give you even more, as you can notice from our list of benefits. We also provide our professional services in nearby areas: Cockfosters, Oakleigh, Trent Park, Hadley Wood, Enfield Chase. Improve the look of your office – the experts of commercial window cleaning will deal with that. As part of our specific method, we use water-fed extension poles. With this approach, we can clean thoroughly the exterior of your workplace, as high as the fourth floor. To reach higher windows we use rope access. We make sure your windows will look pristine, regardless how highly placed they are. With the assistance of the squad of specialists London's skyline is never going to be dirty. You can rely on the team - they are one of a kind specialists of window cleaning. They all have passed through diverse training, so you can receive second-to-none help for all glass surfaces kinds. What we can clean includes: small, double, garden windows, bay or sash windows, patio doors, French doors, conservatories and roof windows. Your building can freshened swiftly with our help. Call us every time you need efficient window cleaning for your house or business. We use the most advanced methods to make sure that you receive highest quality window cleaning. With our water-fed extension pole system and high pressure cleaning methods, you will enjoy crystal clear look of your glass surfaces. We attach our poles to water supply in our vehicles to make sure that there is no risk for the exterior of your dwelling or business building. For high-rise windows, we utilise fully secured rope access technique. You can use the advantage of these cleaning methods now – just ring 020 3746 3113! 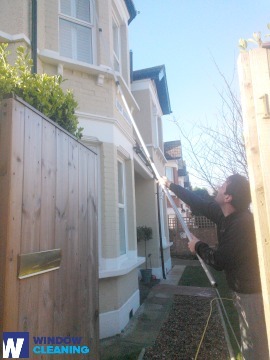 Hire us for window cleaning in New Barnet for your residence. We will use mentioner earlier techniques – water fed extension pole system for lower windows and rope access tools for higher ones. For the entire service we use purified water. Request a cleaner today – ring 020 3746 3113 and speak with our call centre staff. Or just fill in our on-site booking form or use our chat option.